I know some of you are sick of seeing hearts now that Valentine's Day is now over. However, I wanted to share this because it really wasn't for Valentine's day. I was experimenting with a easy crochet heart pattern that I found. I made some of my own changes and then turned it into a garland for my daughter's bedroom. Here is the link to the original pattern, Large Lacy Heart. Also, if you are into looking for some more patterns for crochet, be sure to check out the site. I must warn you, you could spend hours looking because there is so many patterns. My daughters room is kinda blah. I really wanted to do something to make it girly and colorfull. As you can see outside there is no sun and there is snow. It has been grey for days, really depressing. I am so ready for the warm weather! How about you? 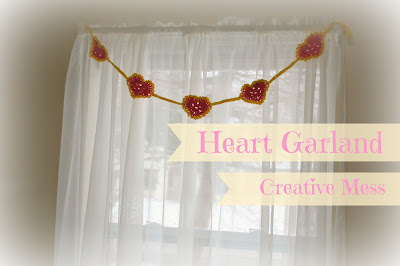 So I came up with this cute heart garland. I finished it last night and hung it up while she was sleeping, so that she could wake up to this surprise. Like I said, I found the original pattern here. 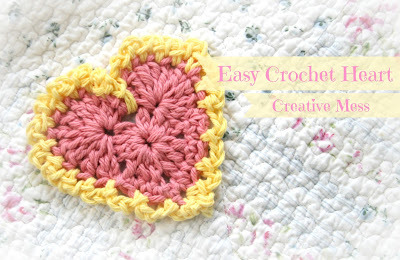 Below is what I did with my changes for the easy crochet heart. Round 2: [ 9 dc in center hdc of the next 3-hdc group, slip stitch in the Ch - 2 space ] 2 times; sc in next 3 hdc, sc in next Ch - 2 space, sc in next 3 hdc; join with slip stitch to the first hdc. Finish off. Round 3: Right side facing, join color 2 with slip stitch to second sc of second 3 sc group....Note: this confused me. To make it simple it is where the bottom point is. Ch - 3, slip stitch in same sc, [ Ch - 3, skip the next sc, slip stitch in the next sc ] 2 times, [ Ch - 3, slip stitch in next hdc, Ch - 3 ] 9 times; working over next slip stitch, slip stitch in Ch - 2 space on round 1...Note: this is the dip that gives it shape for the heart. [ Ch - 3, slip stitch in next hdc ] 9 times; Ch - 3, slip stitch in next slip stitch, [ Ch - 3, skip next sc, slip stitch in next sc ] 2 times; Ch - 3; join with slip stitch to first sc. Finish off. Weave the ends. Attach the lines on wrong side of heart. Those hearts are so cute, I really need to learn to crochet! 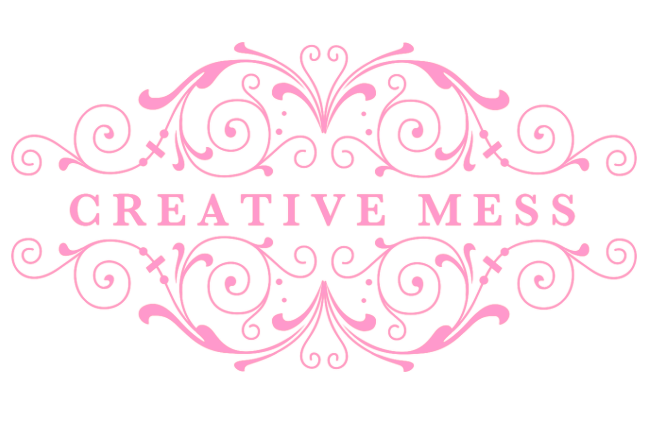 I am popping of from the blog hop at Dysfunction Junction :) LOOVE all the crafy ideas on your blog! Love this! The garland is beautiful - love the colors. I'd be thrilled if you'd link up at this week's Off the Hook! This is so adorable. I love the yellow and pink together. I've been crocheting hearts and flowers this week, too. I'm using crochet thread--it's an easy project for traveling. Always love a garland...this is so sweet and colorful, perfect for a little girl! How simply wonderful! I'm pinning this to my crochet board! I found you at the No Rules party @ Sincerely, Paula! 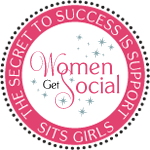 I'd love for you to share this with our readers at the Pinterest Power Party and get pinned! Hope you have a Terrific Thursday! just adorable, hearts are perfect no matter what time of year! I follow you , Hope you will visit my blog and follow too. I can never have enough crochet hearts in my life, love your pattern & will be trying that first chance I get! I love this! Great job! I'd love to feature you sometime! Hi, I am a new follower to your lovely blog (Via GFC)and it really feel pleasure meeting new awesome bloggers like you. Found you through Saturday Bloggy Takeaway. Anything crochet gets me every time. Thanks for linking up on the Getting to Know you blog hop! Darling little heart! If I knew how to crochet I'd make it "just because" without any holiday in mind! Visiting from Meet and Greet. Following from the blog hop cute garland! Hi, thanks for co-hosting the blog hop. I'm a new follower. I love the heart. When I was a little girl, my mom tried to show me how to crochet but it just didn't click. I really wish I would have tried harder. Have a great weekend! I love hearts - all year round! =0) This garland is really pretty. PS - Meet & Greet hop is open all weekend long, if you'd like to come join us. Thank you for sharing this one. I have been crocheting as well, but I want to know how to make those hearts and now I stumbled upon your cute heart crochet. So cute! Following you via GFC via Blog hop. Hi - I came from the Power of Pinterest party. Pinning your cute little heart! The crocheted garland is absolutely the cutest! Love it! Pretty! Love the pink and yellow colour combo! What a cute idea! 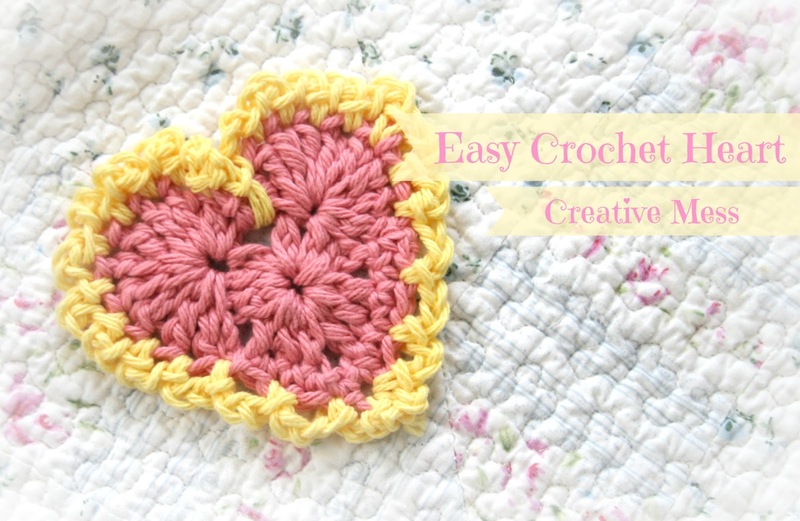 Love those crochet hearts, and your layout is really adorable! My granddaughter-in-law made hearts for favors for a bridal shower we hosted together. They were pins for the ladies to wear. New follower and fan here. You MUST come to my Wonderful Wednesday blog hop to add your links. Promise me! OK? Thanks for sharing on Tutorial Thursdays, it was great having you over. Thanks for sharing. I am making some little crocheted sachet bags and I want to embellish them. The crocheted heart will be perfect. I will do a post on them when I am finished and let you know so you can see how your idea inspired me. Those are super cute! I should give that a try cuz my daughter would just love them! Very cute!! Thanks for sharing this at my Pin Me Linky Party. I hope you come visit & link again.